3BR Powersports' Brulloy material withstands cold, and custom electronics are compatible with major smartphone brands. 3BR Powersports www.3brpowersports.com is offering riders the sealed USB charging solutions they have been waiting for to charge their GPS or Smart Phone while on the trails. 3BR’s TAPPTM, TAPP-LiteTM and Panel-TAPPTM stand up to the dual problems of cold, snowy conditions and dirty electrical power in ways never seen before in snowmobile electronics. A patented, weatherproof connector system is included that works with all USB charging cables and the robust electronics are professionally designed to work with the modern USB charging requirements of iPhone, iPad, Droid, Samsung, LGChem and Blackberry. The TAPPTM is 3BR’s handlebar-mounted solution for Snowmobiles. TAPP products come with a patented universal mounting system that adheres to various sizes of handlebars or even flat surfaces. Input voltage can range from 8 to 16VDC while the TAPP provides clean power for items such as an iPhone or Garmin GPS. There is a replaceable sealing cap that can be left on indefinitely when there is no device connected for charging. The power cord is reinforced, the input power is fused, and all of the materials are UV-rated. TAPP systems are made with advanced BrulloyR not just PVC rubber, for advanced durability. The TAPP CAPTM is necessary to complete this system. The TAPP CAP is a sealing cap that fits over the charging cord for the device and mates to the TAPP charger housing. The PANEL TAPPTM is perfect as a dashboard charging port or inside a storage compartment. It occupies a small amount of space and installs with a spin-on backing nut. The patented design will fit panel thicknesses up to ¾" (19mm) and features a replaceable sealing cap. 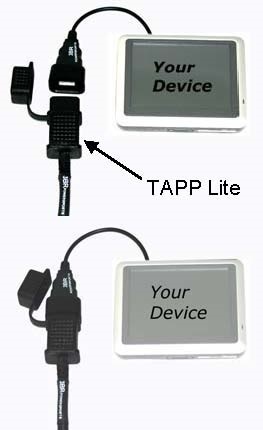 PANEL TAPP will give serious snowmobilers confidence to keep their smart phone or GPS charging while they enjoy their sport. All TAPP products are designed and manufactured to the highest quality standards both electrically and mechanically for years of use in rugged conditions. Don Blackwell and his son Kurt are the founders of 3BR Powersports, a powersports electronics manufacturer based in Pleasant Prairie, WI. The Blackwells are life-long inventors, and Don is an engineer with more than a dozen patents to his name. 3BR has exclusive rights to their water-proof USB cable cover design via via U.S. patents # 7,914,306 and 8,079,560. Sledding fanatics should beware of low-quality "knock-off" versions of their patented designs that are made from inferior materials and allegedly violate United States patent laws. To obtain more information on the advantages of the TAPP USB charging systems or for any other information please visit www.3brpowersports.com or call 3BR at 408-725-8010. G-Force Consulting's Motorcycle, ATV and UTV Battery Market Report Generating "Huge Interest"